Our last ‘organised’ excursion in Rarotonga was also the one that I had been looking forward to the most. 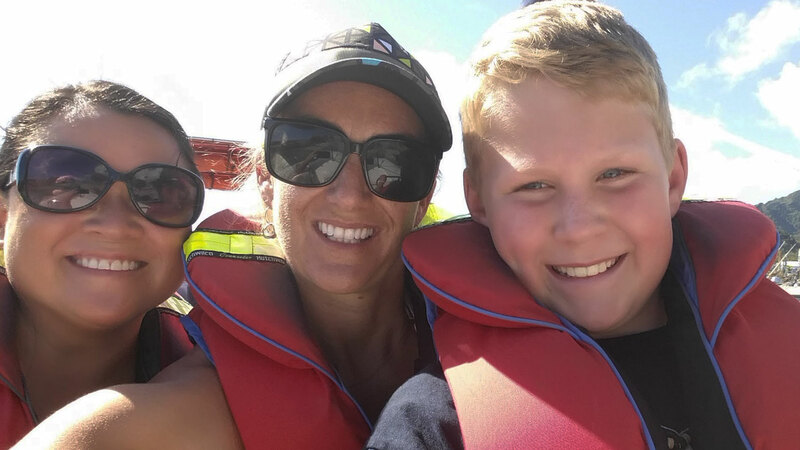 We had the amazingly good fortune of booking our trip during prime whale watching season – I cannot impress upon you how excited I was when I realised this! Humpback whales migrate through the Cook Islands from July through October to mate, give birth and to rest. 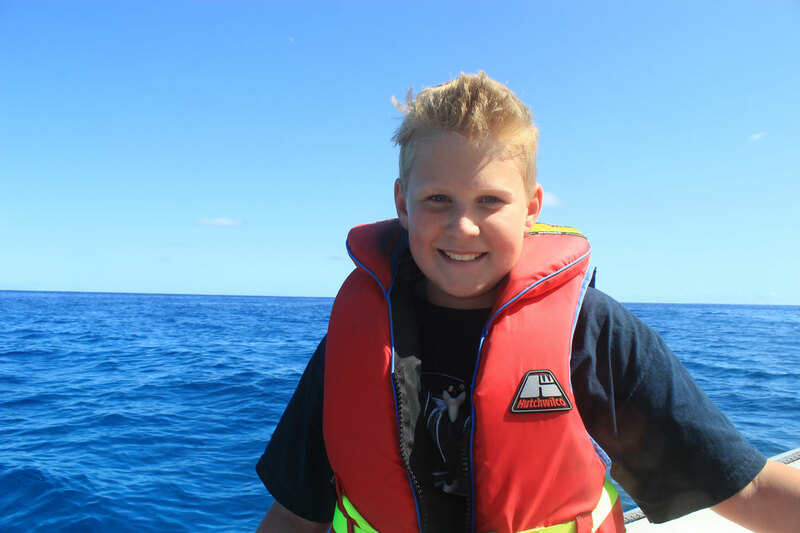 The whole of the territorial waters of the Cook Islands are a whale sanctuary and we visited at the end of August through to September 8th. And did we see whales? Two days after we arrived we were on a bus back to our accommodation after spending the morning at the Saturday Markets. As we were heading out of Avarua, the main town, I saw a mama and baby humpback spouting a couple of times before the view was obscured by those damn coconut palms lol. A couple of days later we ate dinner on the beach at Black Rock and watched the sunset whilst a pod of whales swam past, all spouting and doing some tail slapping. Dave and E saw a whale breach quite close to them while they were on their fishing charter and I was insanely jealous, not going to lie! 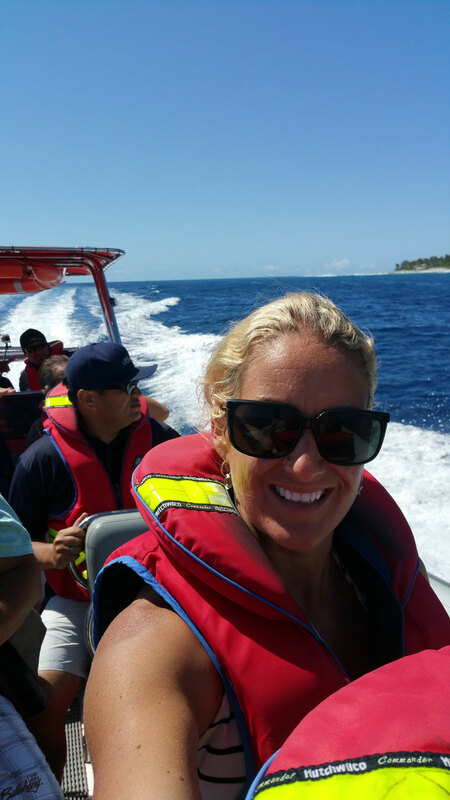 So when it was finally time to head out with Jackie and the team from Rongohiva Watersports I was SO excited! Aside from the knowledge that I was 100% without a doubt going to cry tears of joy if I saw a humpback lol. The Eturere, Rongohiva’s 8.5m rigid V-hull inflatable, is the most insane boat I’ve ever been on – and I know my boats believe me. Boasting twin 250 horsepower engines, I’m fairly certain this is the fastest boat in the Cook Islands! – with the best sound system and playlist. And the most comfortable seats. And the most smiley happy crew who were all so passionate about their jobs, the feeling on-board was amazing. We decided to leave Nixon on the beach with Dave and I’m so glad we did as he has problems sitting in one spot, and the stress of wrangling him would’ve totally killed my peaceful-whale-vibes. Tara, Ethan and I sat up front and soaked in the view as we headed out of the harbour. Fate was smiling on us as I swear as we had just cleared the breakwater, not 5 minutes into our trip and we saw a humpback ahead. On cue, I cried. I’ve loved whales my whole life and finally getting to see a humpback was one off the bucket-list for me. I was so overwhelmed I barely managed to snap any pics (SO, so unlike me I know! ), but I’ll never forget seeing that big, beautiful tail playfully slapping the water. 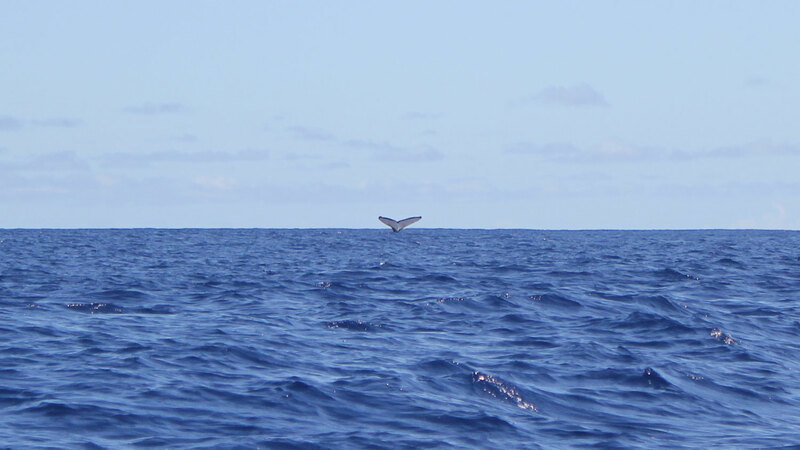 Our whale friend eventually moved on and we were treated to a little high speed fun on Eturere. It was almost incomprehensible to be going SO fast, and be so comfortable and almost gliding across the water with no bump-jolt, up-down, crash-bash. None. At. All. This was the first time I had been out in the open water surrounding Rarotonga, and though it doesn’t translate in the pictures, the clear, cobalt colour of the water is equally as breathtaking (in a different way) to the bright turquoise water in the lagoons that are normally associated with Rarotonga. Also no sea-sickness. This boat is the business people! Let’s talk about gorgeous Jackie for a moment. She was our amazing hostess and is half of the husband and wife team who manage Rongohiva Watersports. Both Jackie (B.A.) and husband Teina (Ph.D.) are Marine Scientists and are very obviously passionate about what they do. I have never actually seen anyone smile as much as Jackie does and her warmth and joy at being out on the water is totally contagious. The crew were equally lovely, so safety conscious, funny and immensely knowledgable. These are operators that show huge respect towards the humpbacks. As soon as we spotted the whale, the Captain cut the engine and we didn’t move any closer toward the animal. It was lovely being able to take this time to cry watch and appreciate what we were witnessing and swoon over our beautiful surroundings. For kids under 5, I would say whale watching is a case by case basis. My 2 year old is simply not chilled out enough to sit and enjoy the boat ride, he WILL not sit still, ever. So this was not for him unfortunately. Jackie is super helpful and kid-friendly – she’s a mum too – so chat with her about your family’s requirements if you have any questions. Rongohiva Watersports is not just all about whale watching, they also offer speed boat + swim, banana boat and snorkel + cruise packages or contact them for charter info and package bookings.